Back to School Safety Tips As summer days grow shorter, communities are observing that timeless annual ritual: the first day of school. The beginning of school is also a time when children are at increased risk of transportation related injuries from pedestrian, bicycle, school bus, and motor vehicle crashes. Many more children are on the road each morning and afternoon and drivers’ patterns change. So as schools open their doors and students return to school, it’s time for everyone – motorists, parents, educators, and students – to improve their traffic safety practices. Red overhead flashing lights, possibly accompanied by an extended stop arm tell you the school bus is stopped to load or unload children. State law requires you to stop at least 20 feet from the front or rear of the school bus when red lights are flashing and not proceed until such school bus resumes motion, or until signaled by the school bus driver to proceed. Be alert and ready to stop. Prepare to stop for a school bus when overhead yellow lights are flashing. Drive with caution if you see the yellow hazard warning lights are flashing on a moving or stopped bus. Watch for children walking in the street, especially where there are no sidewalks. Watch for children playing and gathering near bus stops. Watch for children arriving late for the bus, who may dart into the street without looking for traffic. When backing out of a driveway or leaving a garage, watch for children walking or biking to school. Help your children learn and practice the safety rules for walking, bicycling, or riding in a passenger car, school bus or transit bus. Be a good role model, especially when you are with your kids. Always buckle up in the car, always wear a helmet when biking, and always follow pedestrian safety rules. Supervise young children walking or biking to school or as they wait at the school bus stop. Teach young children the safety rules for traveling to school, whether it be walking, bicycling, or riding in a motor vehicle or on a school bus. If you ride a school bus, learn and practice the safety rules for waiting at the bus stop, getting on and off the bus, and riding the bus. If you walk to school, learn and practice the safety rules for pedestrians. Always cross at cross walks, obey all traffic signs, traffic lights and safety patrol instructions. Buckle up when you’re riding in a car and ride in the backseat. It’s the safest place for young people. Be a good role model for your younger brothers and sisters and friends, and help them learn and practice the safety rules. 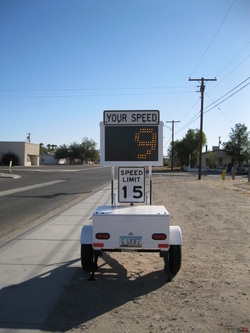 The Parker Police Department recently received a portable radar speed sign obtained through a federal grant. Parker residents should start seeing this sign mainly around the schools zones, as our concern is for the safety of our children. The sign isn't a photo enforcement radar and is only there to make drivers aware of their speed, so that we can make our streets safer for everyone who uses them.